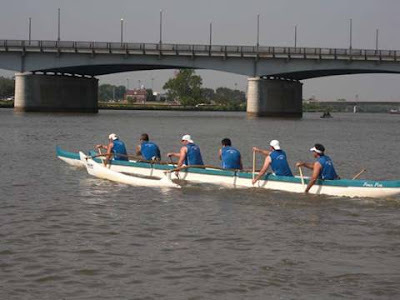 The Philadelphia Outrigger Canoe Club makes it look easy! There's something universally peaceful about being on the water. Listening to the waves lapping at the shore, feeling the boat rocking gently, the smell of fresh air...that is, until the steersman/woman yells "hut!" while you're paddling like mad and trying to keep time with the seat in front of you. Your core is toast, your lats are screaming, and you're flying across the water in a long, skinny boat with five other people. Or at least, that was my first experience with outrigger canoeing. Modern-day outrigger canoe racing has its roots in Hawaiian culture. The boats are regular canoe-type boats with an outrigger attached, which acts as a balance. The outrigger is attached to the canoe via spars, and extend outward to an attached floatation device, the ama. We worked with single outrigger canoes, but doubles and other variations exist. Paddles are traditionally made of wood, but there are newer, lighter weight paddles now. All outrigger paddles have a bent shaft, which was new to me. The canoes we used were standard six person canoes and each paddler generally has a specific role. Each paddler's seat is numbered 1-5, and each paddles on alternate sides of the boat. The stroke, or seat 1 paddler, is responsible for setting the timing while seat 2 is responsible for following that timing. The heavier, stronger paddlers sit in seats 3 and 4. Seat 5 is also a strong paddler, but should be able to assist the steersman/steerswoman, or the captain in seat 6, in directing the boat. It's a sport that can be done in the rough waters of the Pacific Ocean or on flat water, depending on what you're lucky enough to have access to. I had the opportunity to try the sport for the first time under the guidance of the Philadelphia Outrigger Canoe Club (POCC) as part of the Crossfit Love sport series, and gleaned a few lessons for first time paddlers. It's definitely one of those sports everyone who enjoys being on the water needs to try! The POCC teams on the water. (Image courtesy of the POCC). 1. Go with the pros, and pay attention. The POCC was among the first groups of its kind on the East Coast. The Schuylkill is certainly no Pacific Ocean, but it made a huge difference to go with an experienced team who could teach us the ropes. 2. Timing, timing, timing! It's seat 2's job to match the stroke's (seat 1's) timing, and that timing trickles all the way to the back of the boat. When we were paddling in unison, the canoe would jump forward. If we weren't, it felt like we were working against each other. The toughest part for me in seat 2 was when Andrew called "hut!" from seat 1 every 15 strokes, and we had to transition from paddling one side of the boat to the other. The experienced canoeists made the transitions quickly and easily, but it took me a bit longer, which affected the timing of the entire boat. 3. Never stop paddling. Ever. Being in seat 2 comes with a serious amount of responsibility. Serious. Responsibility. I had to set the timing for the rest of the even numbered seats behind me, and if I screwed up, we could all die. (Not really, but still, it was a lot of responsibility!) Outside of working to keep time with the paddler in front of you, it's important to keep paddling, no matter what. No matter how tired your shoulders get from lifting the paddle, no matter how sore your lats get, no matter what shiny things there are to distract you, never stop paddling. If you do, it affects the timing of the paddlers behind you. 4. No talking in the boat! Before we got out on the water, POCC President Neal Daikawa told us not talking in the boat was one of the most important things to remember. The steersman is the only person in the boat who should be speaking; the rest of the boat should be listening for instructions. The steersman is reponsible for telling the crew to increase stroke rate, increase pressure on the paddles and where competing boats are. More importantly, if you're talking, it means you're not paddling hard enough. And if you're not paddling hard enough, you're in trouble. I'll just leave it at that. 5. Be in the boat that doesn't flip...unless you want to be. Jill and Neal explained over and over how easy it can be to flip an outrigger canoe, even though they look balanced and sturdy. If anyone leans too far to the non-outrigger side, particularly those in seats 3 and 4, the boat can capsize. On a hot summer day in beautiful, clean water, a dip in the drink might've been desirable, but for the one Crossfit Love boat that flipped, it was an unwelcome surprise. (Anyone who's ever looked at the Schuylkill River knows why!) As a note, make sure you've got someone in your boat strong enough to help flip it back over, and plenty of bailers. The POCC is always looking for new members, be sure to visit their website if you're interested! And huge thanks to Andrew Hazelton for providing photos. If you've tried outrigger canoeing, do you have any tips for beginners? Tell us in the comments or on our new twitter account! Nice pics, thanks for sharing. I learned a lot from this post about the tips in doing this sport. Great post. Glad you liked it, and hope you're able to try it soon! I hope so .. I have ideas already if I will try it soon .. thanks !